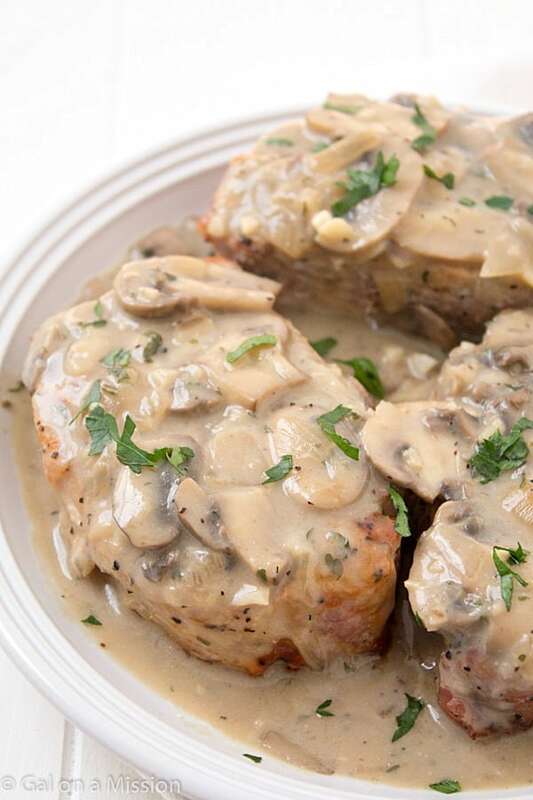 Pork Chops with Creamy Mushroom Sauce: So moist and baked to perfection with an out-of-this-world creamy sauce! Until a couple years ago, I wasn’t a fan of pork chops at all. They always seemed to be so dry and hard to chew, until I experimented with the thick-cut ones. 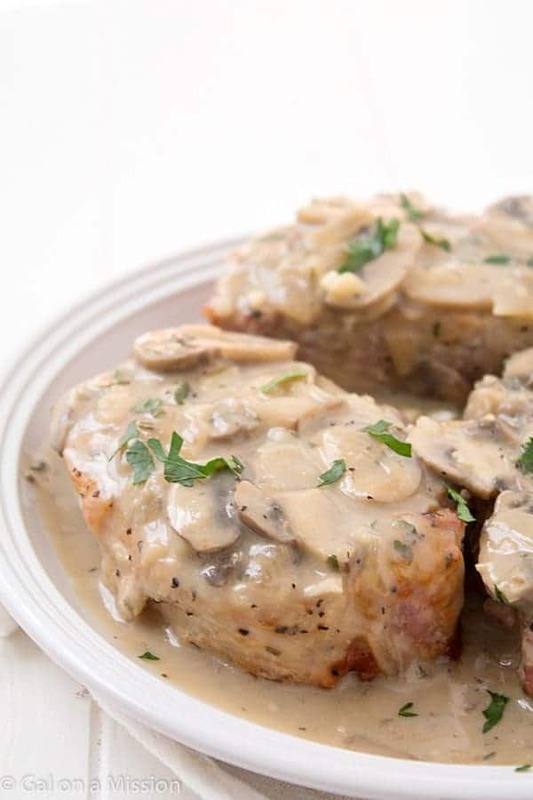 I know you will love these pork chops because they are easy and the flavor is phenomenal! With every thick-cup pork chop I make, I always sear each side in a very hot cast iron skillet and then bake them to perfection. Pork chops tend to dry out on the stove-top, but not when they are slowly baked. When baking them, you can leave them covered or uncovered. I allowed them to bake mostly covered and then I took the cover off, which allows them to brown a little bit. After this weekend, I really looked forward to having these little guys for lunch – just what my body had a craving for. 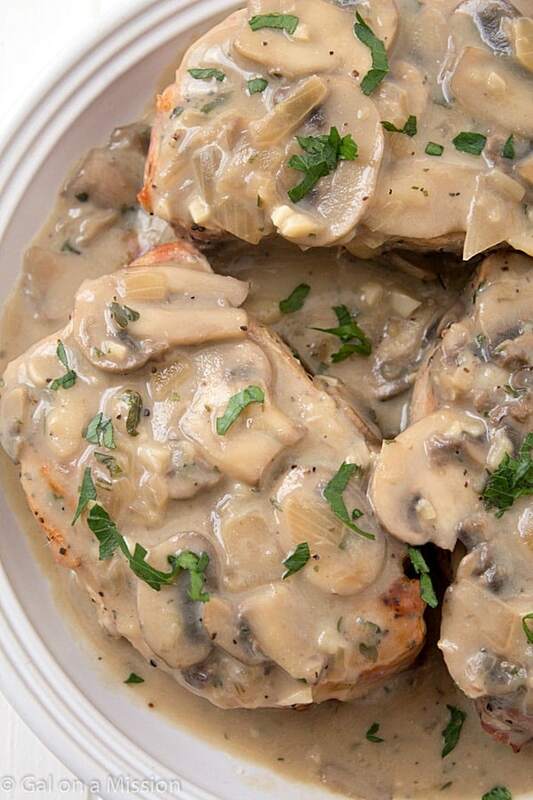 Okay, back to these amazing pork chops with creamy mushroom sauce, shall we? 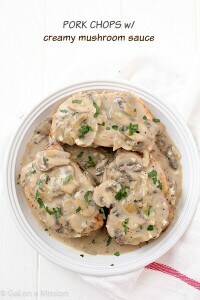 For the creamy mushroom sauce, I waited until the pork chops were done baking so I could use the same skillet. Once you remove them from the oven, you will notice a thick, sauce-like substance on the bottom and it’s so good, plus it adds a lot of flavor to the sauce. Once they were done baking, I removed them to a plate and covered them with aluminum foil and then worked on the sauce. It did take longer for the meal to come together, so do which method works best for you – using the same skillet or using another. Place your skillet over medium-to-high heat and allow it to warm up. Once warmed, add the olive oil to the pan and bring the heat to medium-heat. Salt and pepper one side of the pork chops, then place the pork chops down with the seasoned side. 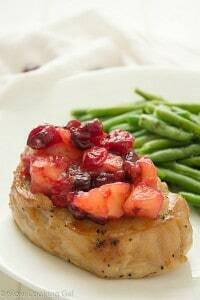 Allow the pork chops to sear for 1-2 minutes. Do the same with the other side. Preheat oven to 350 degrees. Cover the skillet with aluminum foil, then bake for 45 minutes - 1 hour. Uncover the pork chops for the last 10 minutes of baking. Once the pork chops have finished cooking, remove them from the skillet and place onto plate, covered with aluminum foil. Whip the skillet with a paper towel and saute the mushrooms and onions over medium-heat until they are tender. Whisk in the broth, garlic, salt, pepper, dried thyme, and dried parsley. Whisk the flour into the milk, then whisk the milk/flour mixture into the broth. Simmer for 10 minutes, allow the sauce to thicken. Serve the creamy mushroom sauce over the pork chops and then serve with your favorite side dish. *The amount of flour will depend on how thick you like your sauce. I use 1 tablespoon and it was still a little runny. Mmmmm! Hope you enjoyed it, Maria! I’m planning to fix this…this wkend but I wanted to dbl check that even though I’m using thick chops that the cooking temp& time is 350 for 2 hours??? You’ve never had them turn out dry? Please answer as soon as possible. Thanks for great recipes!! Hi Patty. So sorry it’s a typo and I’m surprise no one has pointed it out yet. Just updated the recipe. Thank you so much for pointing it out to me! Noticed garlic in the ingredient list but not in the instructions. Just updated the recipe, Cristel. Enjoy! I made this last night it was so good!! My husband couldn’t get enough of the mushroom sauce!! 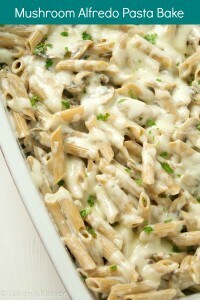 Definitely adding this to my recipe box!! Thank you for sharing it! !